Limit 1 per person and 1 per table. Valid on Specialties and Mexican Dishes menu items only. Beverages not included. New customers only. Dine-in only. Promotional value expires 365 days after purchase. 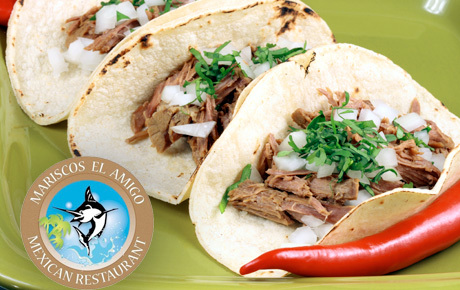 Ride a wave of deliciousness with this deal for 50% off Mexican cuisine from Mariscos El Amigo in Hanover Park ($24 value). This longstanding restaurant offers a tasty array of seafood dishes in a vibrant, welcoming environment. The entire staff at Mariscos El Amigo treats the restaurant like its own home and the customers like family. Mariscos El Amigo offers a variety of Mexican classics like fajitas and enchiladas, but it's the seafood that steals the show here. This deal is valid for anything on the "Specialties" or "Mexican Dishes" portions of the menu, providing you with many delicious dining options. Try the classic carne asada, a skirt steak served with rice and beans, or opt for sizzling fajitas. You can also try some of Mariscos El Amigo's specialties like the camarones a la plancha, or grilled shrimp, served with rice and salad.